So I've been blogging for something like 6 or 8 weeks now, thanks to the encouragement of folks like Marcia and Collin (my hero, for no particular reason). And I've been bopping along, feeling good about blogging, about writing in a new genre, about realizing--through practice--what a creative pedagogical space blogs open up. Now, I'm not particularly interested in "defending" myself, but I am interested in (at least) two things: why I'm bothered by the way the notion of writing alongside one's students gets appropriated (sometimes one seldom stops to interrogate one's own aversions until being called out on it) and why what seemed, to me, like such an innocuous remark was received with such strong aversion. Since I probably can't answer the second question very well, I'll stick with the first one. First, I should say that I do see how this passage could be construed as "dismissive." It's a pretty common rhetorical trope, I think, to elevate one thing (in this case, Jeff's notion of writing in order to learn how to teach) by showing how it is both different from and superior to another thing (in this case, something pretty hastily and sloppily associated with expressivism). And I would guess taking up that trope necessarily tends toward dismissing the thing you're using to make the comparision. But, just to set the record straight (in case anyone is keeping records), I'm hardly dismissive, in real life, of what gets called "expressivism." I put that term in quotation marks because I'm really rather uncomfortable with all those taxonomies that Berlin et al set up back in the late 80s/early 90s. (See, I'm an equal opportunity critic: neither "expressivists" nor "social constructivists" get the full endorsement from me.) Like all categories, they tend toward reduction. But, then again, like all categories, they can be useful when writing in academic shorthand, which I more or less was doing in the above passage. That is, I was doing the "this is different from/better than that" trope, itself a kind of academic shorthand, and I was referring to a category that is associated with a certain practice, just to try to give a very rough sense of what I was talking about. Now that I've parsed out what I was doing there, I'm not sure it's such a great general academic practice, but it is a practice, all the same. But, really, to get to the heart of what I wanted to write here: why do I distrust the "writing alongside one's students" thing? And it is that: a distrust. I haven't really theorized it. And, to be totally honest, I often myself do something that might be called "writing alongside my students," though I don't hold it as a dogma, as something I must do. So why do I distrust it? (This isn't a rhetorical question, btw, I'm really asking myself: I think it's tremendously useful to critically interrogate one's own affective stance toward practices and concepts.) Also, I want to point out (and here, I guess, I am being somewhat defensive) that I was objecting more to the way the practice/idea gets appropriated than the idea in general. That is, I've often heard people deploy this term as something like dogma, and I do distrust that. But, then, I tend toward a distrust of any pedagogical dogma. (Really? Are you sure? Those are useful questions, I find.) And when WAS (writing alongside students) becomes dogma, it seems to often be articulated with a certain kind of general adult/child orientation toward students. Now, I can't document this. (At least not here and now.) It's truly a feeling I have. But it's the same sort of feeling I quite often have when student writing gets talked about in publications (and often in public, too): I want to cringe. It makes me feel like I as teacher am being positioned as a superior being, one who stoops down to "write alongside" these sweet lesser beings. (Or, in the case of student writing getting talked about: like I'm the doctor observing another doctor examine a patient: a la Foucault.) I'm truly not trying to be unkind here to anyone who practices WAS: indeed, it isn't exactly the practice so much as the discourse, the attitude that comes across to my affective sensors. OK. That's enough. Thanks, Mike, for getting me thinking. Comments welcome. Yeah, yeah: I'm another cat-obsessed rhetoric person. So sue me. Move on to the next blog if you couldn't care less. C. and I just stopped by the Humane Society because we were given a lead on an "adorable" kitten there. Said kitten wasn't there (he's in foster care), but little Gabe was. He's not a kitten, but he's quite petite. I completely ignored him because he looks so much like my 18-year-old Clyde (gray and white), and so seemed merely ordinary, but the volunteer on duty took him out of his cage and asked me if I wanted to play with him. Well, sure--I'm not one to pass up a chance to get to know a new cat. After I held him for, oh, a good 10 or 15 minutes, I realized I wasn't going to be able to leave him behind. I handed him over to C., and he fell totally and completely asleep in C's arms. I've never seen such a relaxed cat. Just the ticket for not upsetting my old guy. So Gabe is coming to live with us tomorrow (after a little alteration). Let's hope he really is as laid-back as he seemed this afternoon and that Casey and Clyde take to him without too much hissing and flying fur. And for those who might remember my Siamese obsession of a few weeks ago: I've gotten over it. Ever since Will Richardson at Weblogg-ed posted the link to Eide Neurlearning Blog (specifically to their report on the Brain of a Blogger), I've been taking a look at it now and again. I say this with a somewhat bizarre sense of trepidation: I was raised up intellectually in the 90s, days of hard and fast social epistemic rhetoric and a pretty fierce distrust of cognitive-based pedagogies. I gotta say, I still distrust those good old Flower and Hayes studies, but, then again, surely so does Flower herself, as she's moved into more social-based rhetorics. But as I've been reading more in the study of emotion and affect, I'm pretty fascinated by (even as I retain a healthy modicum of scepticism for) neuroscience (the work of Antonio Damascio [Looking for Spinoza, etc], for instance, not to mention the studies that Massumi references in Parables of the Virtual). ancient Greek) whereby list information is projected on a familiar (autobiographical) scene. Space/memoria/the virtual. Though here primarily for retaining information, surely also for producing, creating, making possible. "Rather than condemning it, we should be exulting in the fact that the Internet is allowing us to once more explore the power of the written language in a creative way," he added. I'm always simulataneously amused and disturbed by people--including some students--who worry over the dire effects of email and IM on students' writings. Now I have some nice research to use as an answer to such worries. I'm heading out for the CCCC in San Francisco early Wednesday morning and will be very unlikely to blog while there. So, until next week, I'm signing off. And a happy Ides of March to all. Just in case there were any doubts, this is not me. The strange thing is that I feel I almost vaguely look like both of them. Even though the two of them don't look alike. But if you morphed their faces together, maybe it would come out looking like me. Or if my old roommate from my freshman year in college was trying to find me and saw their pictures, she might for a minute think that either of them could be me. Well, maybe not. But my old roommate did look me up recently. She lives in Marin County, so I'm staying over at her place on Saturday night after the C's ends. She, however, doesn't look like me. A morass? Hardly. I didn't realize you were doing this kind of historical work now. Bringing in that extended context is what I was originally trying to do in my diss (back when I was doing my diss), then it became more focused and some of the context got lost. This is amazing and important work you're doing: re-visioning the history of composition so that we see more than the narrow halls of English departments. It's so odd how easy it has been for our field to write histories that ignore most of the history that created the conditions of possibility for fy writing. The examples in the paper you linked to are really stunning: "Four of the seven convicted of the 1886 Haymarket bombing at a labor rally in Chicago were executed. In that same year, John Genung published his Practical Elements of Rhetoric." Yes. That puts a rather different spin on the history, doesn't it? Are you presenting on this, by chance, at the Cs? I just don't feel much like blogging at the moment. Instead, I'll just say goodnight. I've been thinking lately, a little obsessively, about Siamese cats. In December my 18-year-old cat, Kitty, died. People often remarked that he must have been part Siamese: he had the Siamese voice. And he was the ultimate cuddle-cat. Not to mention quite the mischief-maker, even after he was diagnosed with kidney failure. I have two cats at home now, both domestic short hairs, one gray and white, one tuxedo. 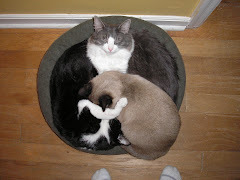 Clyde, the gray and white guy, is 18--he has arthritis and is being treated for hyperthyroidism. Casey, the tuxedo cat, just came to live with us in January. He's about 5, and he needs another cat to chase around and generally befriend. Clyde certainly isn't up to it (though he did manage a couple of seconds of batting at Casey today). So I'm thinking a Siamese cat needs to come live with us. A rescued cat, not a fancy one. I think that should make both Casey and me happy. I can't really speak for Clyde. Mostly, Clyde likes to eat his food. Sean Carroll complains about humanities professors who read--literally read--their papers at conferences. Why, oh why, he asks, don't they speak from notes like scientists do? His query prompted some interesting conversation: go take a look. Me, I tend to read, but with asides and inflections. I like having my whole text in front of me, but I like to make it into something that's worth hearing. But it is an odd thing, no? Why read? What really chagrins me about my own slowness in changing long-established habits is that I really, really want to be able to project images for my upcoming presentation at CCCC but never even thought to request the necessary equipment. So looks like I'll be making handouts instead. Poor substitute. Oh well. I'm already competing with Ulmer's talk as it is; I'm sure he didn't forget to ask for the projection equipment. "'People endowed with social power and prestige are able to use film and media images to reinforce their power - we need to look to film to grant power to those who are marginalized or currently not represented,' said Mr. Herbst, who envisions a future in the public policy arena. The communal nature of film, he said, has a distinct power to affect large groups, and he expects to use his cinematic skills to do exactly that." "At the University of Southern California, whose School of Cinema-Television is the nation's oldest film school (established in 1929), fully half of the university's 16,500 undergraduate students take at least one cinema/television class. That is possible because Elizabeth Daley, the school's dean, opened its classes to the university at large in 1998, in keeping with a new philosophy that says, in effect, filmic skills are too valuable to be confined to movie world professionals. 'The greatest digital divide is between those who can read and write with media, and those who can't,' Ms. Daley said. 'Our core knowledge needs to belong to everybody.'" All the more reason to make FY "comp" courses into courses that integrate a variety of literacies: traditional, visual, digital. Not that the idea of visual media as rhetoric is going to surprise any of my colleagues in rhet/comp (or at least not any who are likely to read this blog), but it's always interesting to see a popular venue putting these ideas into circulation. Metanote: This article is the kind of thing I would usually clip (literally, with scissors) and save, either in a pile with other clippings or maybe in a folder. For the most part, such clippings rarely see the light of day or get much use. Blogging about news pieces that catch my eye is far more productive: writing about them makes them more memorable, and as long as my archive holds up I'll be able to find the link to the article with a couple of clicks. One more reason blogging makes me happy. "Arguing that theories of temporality have significant and underappreciated relevance to the social dimensions of science and the political dimensions of struggle, Grosz engages key theoretical concerns related to the reality of time." Katherine Hayles says this book "is essential reading for anyone interested in understanding how memory, historicity, and politics connect to and are reconfigured by temporality." And Brian Massumi says the book offers "a contemporary dialogue on the politics and philosophy of change." I'll blog more once I've read it, which may be a little while, seeing as I have still yet to finish Booth and also have a Cs paper to get ready. Read about it in the NYTimes this morning, and now I've already found two images that will force me to rethink and make more complex my ideas about office work in the early 20th century. Yeah, well, haven't quite made it to the image uploading stage. At any rate, one image is a photograph of a stenography office pool from 1917. Nothing unusual about that, except each stenographer is black and more of them are men than women. Kind of complicates the stuff I say about office workers in "Taking Dictation." Though it does look they're in a room of their own, out of sight of customers, which I do mention (from Jacqueline Jones's book American Work).Even more intriguing, though: a stenography class at a prison (circa 1920). Wow. Now that's something I hadn't anticipated. Traveling "business school" representatives swept into rural areas in the early twentieth century to sign up young women for secretarial training (my mother was one such young woman so swept up, but not until mid-century), but I had never ever read about prisoners being trained to take up office work as part of a "reform" effort. Though it makes sense--the whole prison/exam connection from Discipline and Punish comes to mind. And maybe it was even thought that learning to do typewriting would have a moral influence on prisoners, in the same way that white women were expected to be good at it because of their supposed superior morals. It's also interesting that I don't see a lot of "joy" being expressed on these faces, not like the joyful (white women) secretaries on display in the early 20th century textbooks I've been reading--though the one woman in the first image does seem to show a slight smile. Hmm. Need to rethink the whole literacy/affect/division of labor thing. More nuance there than I've thus far expressed. My URL contains a misspelling. It should be http://pourquoipas.blogspot.com But if you go there, you'll find a blog (appropriately enough) that's actually written in French! It's really sad to find one's fancy URL is actually not so fancy. Actually, I had no plans to come up with a French URL, but the English version (as it appears in the title of my blog) was taken. All the more reason to become a real blogger and get my own domain address.